This is my take on a fudge cake from Yvette van Boven’s Home Made. 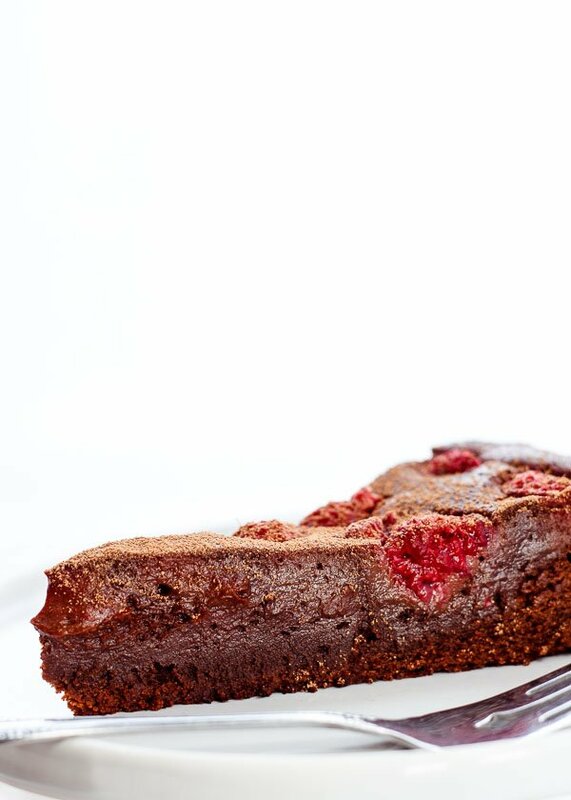 With my addition of berries, it has the creamiest top layer infused with the syrupy juice of bursting raspberries. 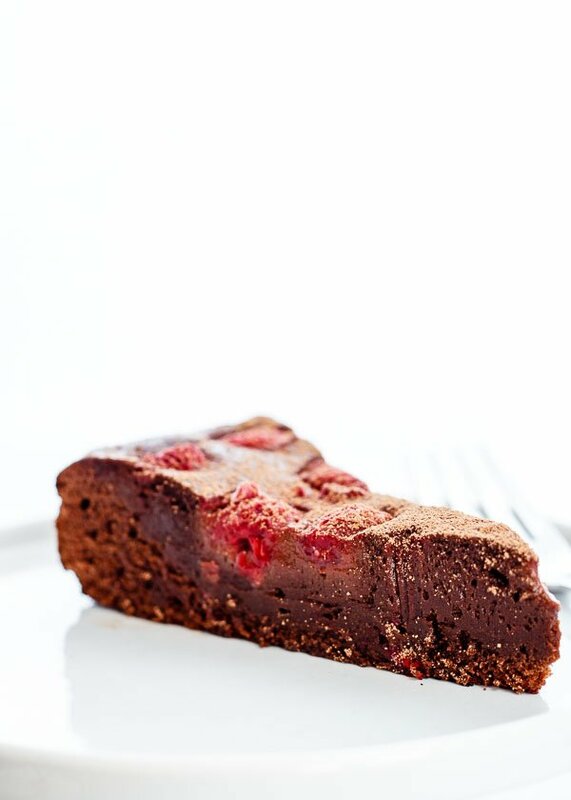 The red berries brighten up the richness of the dark chocolate and look super festive to boot. There’s no need for frosting, since a creamy truffle-like layer is baked right into the center. Plus, it’s a snap to make with only 7 ingredients and bakes up in under 30 minutes. A light dusting of cocoa powder is all you need to finish off this incredibly decadent holiday cake. Springform pan tip: I like to line the bottom of the pan with a sheet of parchment paper, then fasten the rim into place over the parchment. This creates a tighter seal and prevents the bottom of the cake from burning. You can also use aluminum foil if you don't have parchment paper. Underbaking tip: It's important not to overbake this cake. The center should still be glistening and a little wobbly when you take it out of the oven. It will cool into a silky, creamy ganache. Preheat oven to 340°F. Butter an 8-inch springform pan and lightly dust with cacao powder or flour. Shake any extra out. In a small saucepan over low heat, melt the butter. Remove from heat, add chocolate, and stir until smooth. In a small mixing bowl, whisk flour with baking powder. In a medium mixing bowl, whisk sugar with eggs. Add the flour mixture and whisk briefly, then add the melted chocolate butter. Using a hand mixer, briefly beat the batter just until smooth, about 10 seconds. 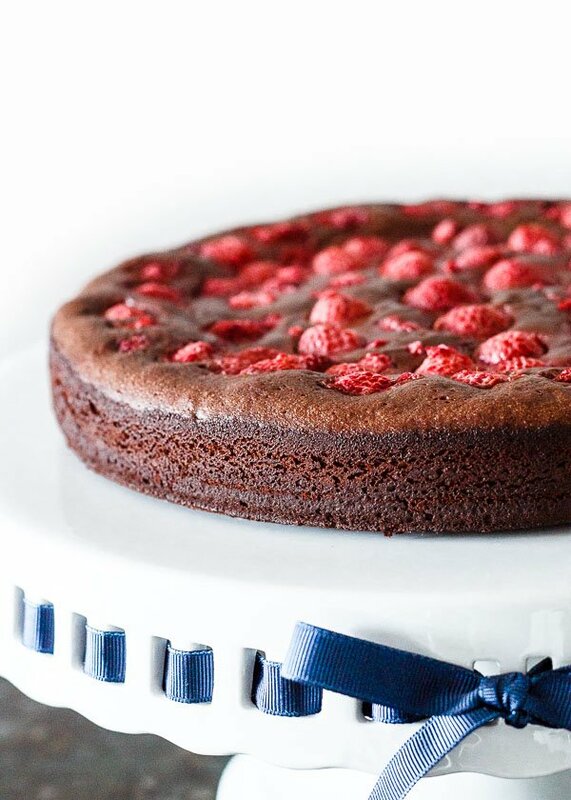 Pour the batter into the pan and dot with raspberries. Press the raspberries into the batter a little, but do not submerge them. They should be half exposed. Bake for 28 minutes on the center rack, rotating halfway through. 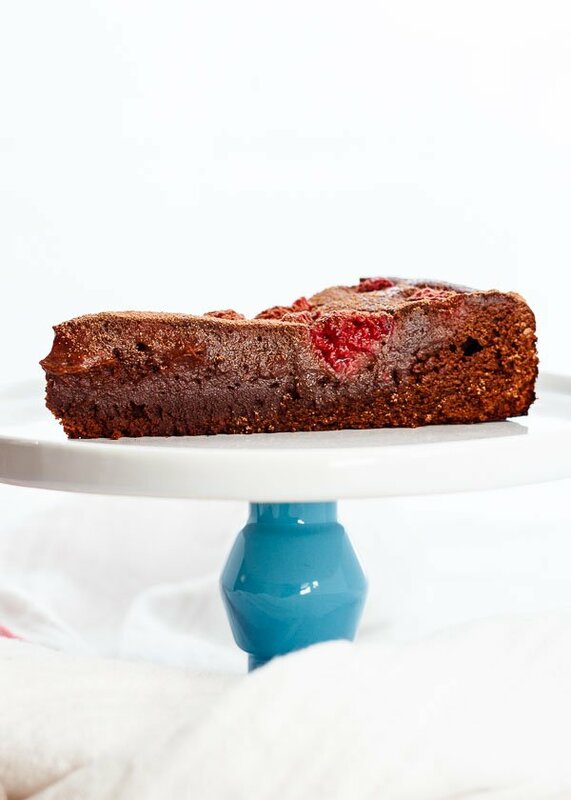 The cake will come out with rivulets of raspberry juice over the surface. Let the cake fully cool in the pan on a rack, then cover until ready to serve. The raspberry juice will seep into the creamy top layer after a few hours. If you refrigerate this, bring it back to room temperature before serving. Lightly dust with the remaining cacao powder just before serving. Awwww…..thanks Lu, for the mention. Even tho I lost no sleep over your absence, something was missing and now glad it’s back!